Larger LCD panels these days are a lot more interesting from a creative perspective with variables including Shape, Size, Brightness and Curve. For a start there are over 400 panel models (with backlight) over 30″ listed as in production. For a long time displays were 4:3 aspect ratio then with the advent of HD in the 1990’s we got 16:9 and these two remain the mainstream shapes. 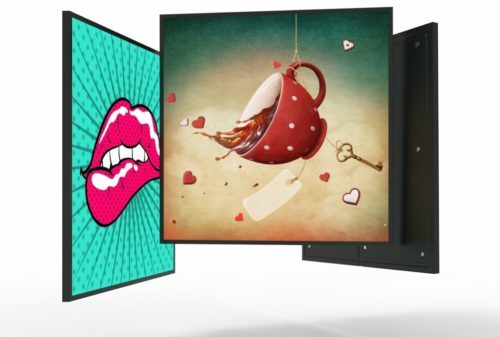 However as anyone in the display industry will know, super wide aspect ratio panels (often referred to as stretch, banner or bar type) have been available for some time and are getting considerably more common. Many of these are cut from larger panels to achieve custom sizes but there are an increasing number of standard models, especially with high bright backlights. Not as mainstream but getting more visibility are other shapes such as square panels, I know of two sizes, 26.5″ and 40″, and these are eye catching. We have done a number of projects using square panels as part of a mosaic type wall arrangement mixing, square, 16:9, and super wide panels. Curved panels made it to consumer TV’s and OLED has helped with that. But for commercial applications the big market has been gaming machines and I was interested to learn recently of J shaped panels, these are just curved in the lower half of a portrait oriented panel. This gives rise to the description of C shaped (evenly curved) and J shaped panels. And finally brightness, while there is an active market in panel backlight enhancement a quick database search shows 385 panels larger than 6″ with brightness over 1,000nits, of these there are 78 models larger than 30″. * As noted on Wikipedia it is only since 2010 that 16:9 became the most common aspect ratio, overtaking 4:3.